Brain Age, Neurotransmitters, and Brain Health - The Cutting Edge Work of Dr. Eric Braverman M.D. Brain age and balanced neurotransmitters are vitally important to overall health and wellness. Imbalances can lead to impaired memory and even alzheimer's symptoms. Let’s explore this concept via the groundbreaking work of antiaging’s foremost proponent of brain health, Dr. Eric Braverman M.D. Who is Dr. Eric Braverman M.D.? Dr. Eric Braverman customarily begins his lectures by saying, “the head is connected to the body,” then pauses to let that simple but dramatic reminder resonate with his audience. Thus begins his fascinating talks to audiences of health professionals, about brain health, and the importance of balancing neurotransmitters for overall wellness. He calls this concept the Edge Effect, which is the title of his latest book on the connection between brain age, brain function and overall health and wellness. This concept of course makes perfect sense, but it is Dr. Braverman that has brought it front and center as a new paradigm for the integration of mind and body health. 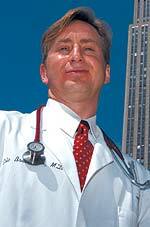 Dr. Braverman runs the prestigious PATH, (place for achieving total health) medical clinic in New York City and Penndel , PA, in addition to having written several cutting edge books on brain health and integrative medicine. He is also the director of the PATH Foundation, a non-profit organization dedicated to the collection and analysis of information relating to all aspects of brain biochemical disorders, and the way in which imbalances of neurotransmitters impact on overall health. Your age in years differs from the physiological age, and the age of your brain. This is really a way of saying that what is really important for overall health is first and foremost brain health and fitness. In my own experience Dr. Braverman’s emphasis on the health of the brain was a wake up call for me. We don’t normally think about it, but your body cannot function optimally if the master controller, your brain is not functioning properly. The cornerstone of brain health is the balance of your neurotransmitters, which are the chemicals that allow your brain’s processing operations to be carried out. A neurotransmitter is a chemical that is involved in processing signals between neurons and other cells. Each of your neurotransmitters is essential to proper brain health and when any one of them is deficient or out of balance with the others, problems result which can ultimately affect all body systems, leading to very serious, and even life threatening health conditions. Your brain age is dependent on the right neurotransmitter balance, and when problems in this area are identified soon enough, it becomes possible in many cases for you to treat these imbalances with diet and over the counter supplements rather than drugs.
. When you complete it, you will know what your dominant neurotransmitter is, and which one you may be deficient in. Reading the book will instruct you on what steps to take once you have identified a possible imbalance, which is why I would highly recommend reading it. I consider this book to be required reading for anyone who values his or her health. I credit Dr. Braverman with bringing this vitally important aspect of brain health to the forefront of our attention. I urge all of you to educate yourselves about the role that brain age, and neurotransmitters play in your overall health.